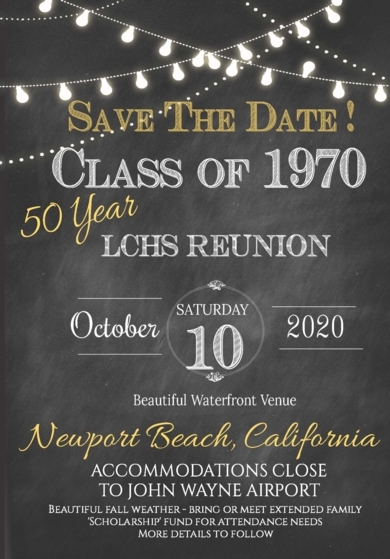 Class Of 1970 (LCHS70) web site! This site has been formed to facilitate communication with LCHS '70 Alumni. It may also prove valuable in contacting individual classmates. We had our 40th reunion on October 8th-10th, 2010. The 45th reunion was August 1st, 2015, with a cocktail party the night before. There are pictures in the Pictures Gallery page! If you have experiences to share from any reunion, add them to your profile page. Should you need help with the site or know someone who is having trouble getting signed up, please email administrator@lchs70.com. There are announcements following this section which you can scroll down to see. However, some announcements are only visible to logged-in classmates. The www.lchs70.com web site was assembled and is maintained by Garrett Hildebrand, class of 1970 (In the yearbook as "Gary"). The idea for it and initial funding of it was provided by Robin Davis Graffam, who lead the organization of the 40th and 45th reunions. March 2019: The 50th reunion committee has provided us with some new names we did not get from the La Cañada High School manifest for the class of 1970. In the case where we do not have contact information and/or this person has never logged onto this site, they will appear in the Missing Classmates list. Please look at this list for names you may recognize and have contact information for, and let us know if you have any new information, please. To opt out of future e-mails from us, please click here and confirm your request. You will receive one additional e-mail confirming your removal. The site administrator can't unsubcribe you from the emails -- you have to do it yourself. Besides the link in each email you receive, you can go to the Notify Me link under Member Functions and change the announcements you want or you can just set the all to Never and you'll never see another one (including reunion announcements). See LCHS Links for link to LCHS class of '69 website. 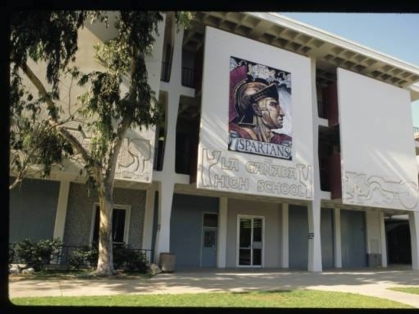 Check-out this video of La Cañada High School. I recommend skipping the first 20 seconds.